Question from Mrs. Kelsey Siano: Will I make your Genealogy Blog? 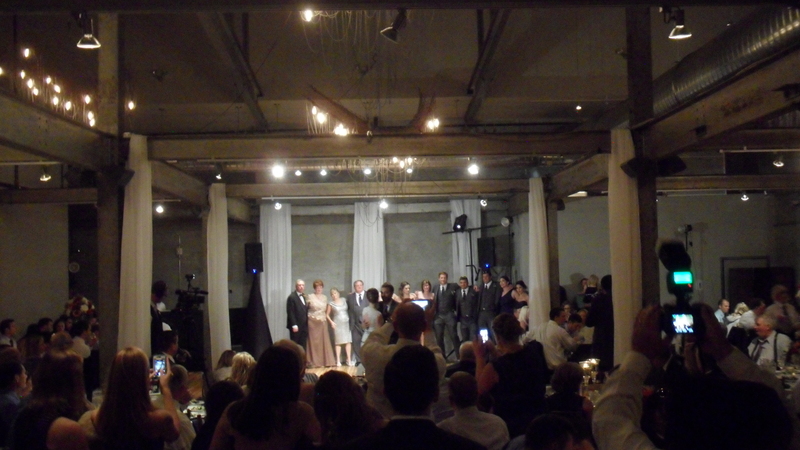 The bridal party gathered for Mr. & Mrs. Siano’s first dance as husband and wife. My delightfully spunky 2nd cousin, Kelsey Campbell, made a fine update to the family tree yesterday, September 20th, 2014, as she married her fiancée Johnny Siano at St. Nicholas of Tolentine Church in South Philadelphia. The reception was held at Front & Palmer caterers. My father and Kelsey’s mother are first cousins. Our closest common ancestors are Joseph A. Graham, Sr., and his wife, Julia Corr Graham. One of Joseph A. Graham’s great uncles was Fr. Francis J. McShane, O.S.A., who was an Augustinian priest, former president of Villanova University, and pastor of the St. Nicholas of Tolentine parish of Atlantic City, New Jersey. It was a lovely evening, as evidenced by the photograph. A warm welcome to the family goes out to Mr. Johnny, now officially a leaf on the family tree! Best wishes to you both!